She might never live in Barbie's dream-house, but Gwen Thompson is the talk of toy town. She's the world's first "homeless" doll. The forlorn figurine is the newest member of the posh American Girl doll collection. She might never live in Barbie's dream-house, but Gwen Thompson is the talk of toy town. She's the world's first "homeless" doll. The forlorn figurine is the newest member of the posh American Girl doll collection. 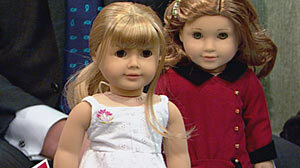 Owned by Mattel, American Girl has been selling expensive and popular dolls for over two decades. This year, they introduced Thompson, a grade school girl who lives with her mother in the family car A representative for American Girl says the doll is meant to teach tolerance and is part or an outreach program teaching young girls how to spot bullying and stand up and speak out against it. In a storybook that details the doll's life, Gwen's mother revealed, "I woke up one morning to learn that my husband had left us, and my daughter and I were evicted -- truly homeless. I always thought homelessness happened to other people. Never to me." Ms. Thompson goes on to describe their destitute lifestyle, "At first, my daughter and I slept in our car. I'd park so that we'd wake up near a wayside rest area or restaurant - somewhere where we could use the sink for washing up - and then I'd go to work and pretend that life was just as it had always been." According to the National Center on Family Homelessness, one out of every 50 American children are homeless. Gwen represents just one of the1.5 million U.S. children on the street. The tragic toy sells for $95 and is part of a 2009 limited edition set. This is not the first time American Girl has sparked controversy. In 2005, conservative groups called for a boycott of all American Girl products after it was reported that the company donated to a youth organization that supports abortion rights and promotes acceptance of lesbians.